If you want to stay in on Valentine’s Day, make this tuna tartare appetizer. It’ll pair well with the bubbly. And – you’ll have fun in the kitchen! 1. In a 4-cup mixing bowl, combine the chopped tuna filet, chives or green onions, ginger, lime juice, olive oil, chili pepper and salt. 2. 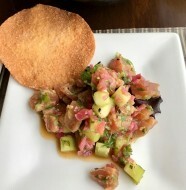 Taste the tuna tartare and, if needed, adjust seasoning and olive oil levels. 3. Cover the tuna tartare and set aside. 4. Meanwhile, using a sharp knife or mandolin, take one cucumber and make paper-thin slices lengthwise. 5. Repeat slicing remaining cucumber. 6. 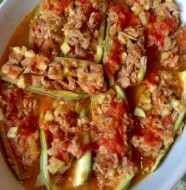 Working with one cucumber slice at a time, place scant 3/4 teaspoon tuna tartare at one end. 7. 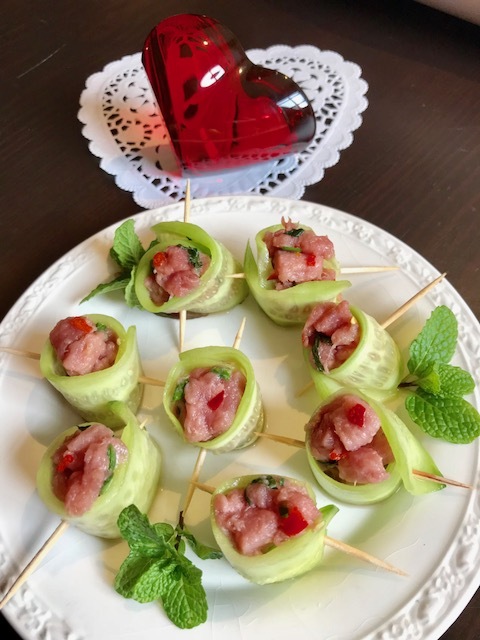 Gently and tightly roll up the cucumber slice; secure the tuna tartare roll with a toothpick. 8. 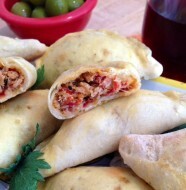 Set each tuna tartare roll on a serving plate. 9. When all rolls have been assembled, serve them immediately.